A bad week for football might do some good? 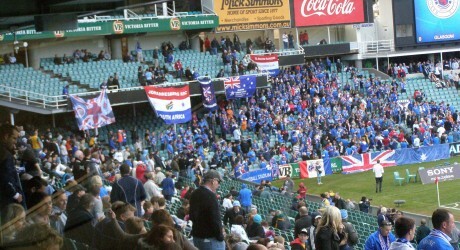 Rangers fans in Sydney in July 2010. Photo: Roy Hay. The game of football has taken a battering this week though it is possible that the crises which have occurred will result in improvement in future. Racial vilification incidents have been the focus of media attention in Melbourne and in England, the once mighty Glasgow Rangers will start next season in the Third Division (actually the fourth tier) of the game in Scotland and the former head of FIFA, Joao Havelange and the president of the Brazilian Federation, Ricardo Teixeira, are now said by a Swiss court to have received massive bribes from the ISL company from 1992 to 1997. John Terry, captain of Chelsea and England, has just been acquitted of racially abusing Anton Ferdinand of Queens Park Rangers during a match last season. Terry protested his innocence throughout claiming that he simply repeated something which was thrown at him during a testy encounter in which sledging on an Australian football scale was rife. Though acquitted of the offence at law, Terry could face an investigation and sanction by the Football Association, whose independent disciplinary commission only requires a balance of probabilities rather than the legal standard of proof beyond reasonable doubt. It would seem that this is double jeopardy but the FA handed out an eight-match ban to Luis Suarez of Liverpool for abusing Patrice Evra of Manchester United. So the precedent might lead to pressure on the FA to act. In Melbourne a match between two clubs, Sunshine Heights Western Tigers and Tullamarine City ended in a brawl among spectators which the Age claimed was sparked by racist abuse of the Sudanese players with Sunshine Heights. Many things are not clear from the report and Football Federation Victoria has been quick to point out that it has policies and procedures in place to prevent racial vilification and deal with incidents should they occur. The tailpiece to the article is a note that one person had given up playing AFL because of ‘racist comments and violence’. So the issue is not confined to soccer and occurs despite the great efforts of both AFL and FFV to combat racist abuse. If the publicity leads to more awareness of the distress caused by this type of ‘violence of the tongue’ then good may come of what has been a very unsavoury episode. Here in Scotland, the mighty Glasgow Rangers, which was put into administration towards the end of the recent football season, will play next month in the lowest division of the Scottish league. Or rather the new company, Sevco, which owns the club will field a team at that level. The consequences for the game in Scotland are only just being worked out and there has been a clear failure of leadership at the head of the governing bodies, of which there are three. The Scottish Football Association has overall responsibility for the game and has the membership of FIFA as its charter to do so. The Scottish Premier League is a separate company which presides over the top echelon with its 12 clubs, while the rest of the senior clubs in the land are members of the Scottish Football League. The league has three divisions and the top team in the first division at the end of each season has no automatic right of promotion to the Premier League. Now that Rangers’ successor club is in the third division the existing Sky television contract is almost certainly to be torn up or renegotiated. Some of the figures being bandied around are derisorily low, so the idea that the game itself should take charge of its own football channel has been reactivated. Scotland tried to pioneer this option many years ago but the experiment foundered when only 80 per cent of votes rather than 88 per cent were cast in its favour. A wider reconstruction of the governance of the game is called for and if it occurs it might do better than the current incumbents have done. Breaking the Celtic-Rangers duopoly might also be no bad thing. 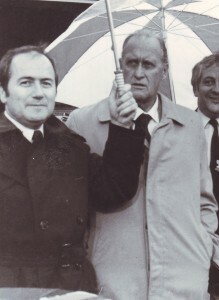 Sepp Blatter and Joao Havelange in Australia in 1983. Photo: Les Shorrock. Les Shorrock collection, Deakin University Library. It was always said around football that FIFA and its leadership was corrupt. Andrew Jennings detailed many of the scandals in his books and articles over the years. Now a Swiss court has provided details of the extent of the malfeasance. Havelange resigned from the International Olympic Committee just before he was due to face an ethics committee investigation into his role in the ISL scandal. Now it is likely that he and his son-in-law will escape sanction as will several other leading members of the organization. Question marks about the current president, Sepp Blatter, will remain, despite his much trumpeted plan to reform the organisation. Perhaps the sponsors and others whose good name is vital to them can do something to bring about a cleansing of these Augean stables, but I would not be holding my breath.